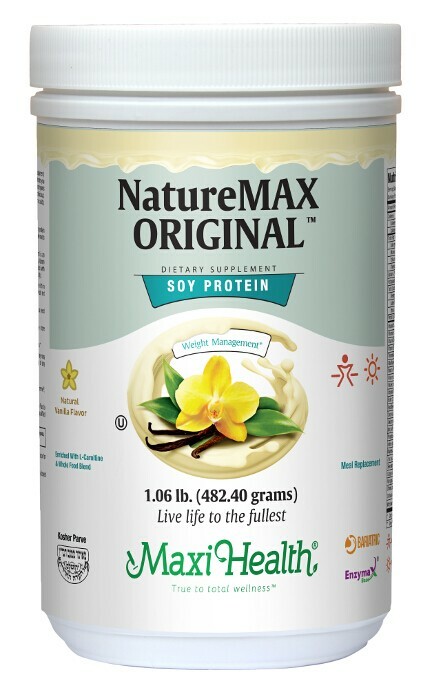 Naturemax™ is a creamy vanilla, delicious, drink enriched with easily digestible soy protein and much more. It supplies you with fibers, enzymes, amino acids, vitamins, essential minerals and powerful antioxidants. Check out the directions and supplement facts tab for yourself. Our proprietary formula is rich in clinically studied phytoestrogens such as soy isoflavones, diadzein, and genistein. Supplement the needs of you and your entire family with gluten free Naturemax™ Creamy Vanilla! Other Ingredients: Isolated soy protein (Non-GMO), fructose, psyllium husk powder, calcium carbonate, acacia gum, guar gum, xanthan gum, natural flavor, magnesium oxide, lecithin (from soy), ascorbic acid, inositol, L-Carnitine, choline bitartrate, Earthrise® spirulina, sucralose, d-alpha-tocopheryl succinate, niacinamide, bee pollen powder, zinc oxide, apple pectin, manganese sulfate, ferrous fumarate, d-cal pantothenate, retinyl palmitate, citrus bioflavonoid complex, Enzymax® (calcium carbonate, bromelain, papain, lipase, amylase, protease, silica), selenium glycinate complex, papaya fruit powder, organic barley grass powder, organic wheat grass powder, TRAACS® chromium nicotinate glycinate chelate, cholecalciferol, pyridoxine HCl, molybdenum bisglycinate chelate, riboflavin, thiamine mononitrate, dextrose, folic acid powder, biotin, potassium iodide, sodium benzoate, cyanocobalamin. This product contains no wheat, yeast, gluten, milk, artificial flavors, or colorings. No added salt. Earthrise® is a registered trademark of Earthrise Nutritionals. I was shopping at my local health food store in Toronto for my usual super food mix, wondering exactly which formula I was getting at what percentage. Sure, some had antioxidants but what about Vitamins I found Naturemax sitting on the shelf at the Healthy Planet (store located in Toronto), and not only did it have vitamins and at quite excellent values, it also had protein plus antioxidants, all from seemingly high quality pure sources and extremely affordable as well. At this rate I will be buying this delicious easy to mix drink for the foreseeable future. Simply amazing, a dream come true, health and peace of mind that wont leave me completely broke. In the morning rush at home, I rarely have time to prepare breakfast. I now drink a cup of Nature-Max in the morning and it gives me energy that I need until lunch! I would like to express my gratitude to Maxi Health for Naturemax. My 5 year old son is very picky with his food and eats mostly snack food. After giving him Naturemax he is looking much stronger and healthier than in the past. He also has more energy to play and run with his friends than before. Thank you so much. Your products are superb! After my baby, I felt very weak. Someone suggested that I start taking Naturemax powder. Not only did I get increased energy, but I found that the milk supply for nursing increased. It tastes great when you make it in a Drinkmaster combined with lots of milk.